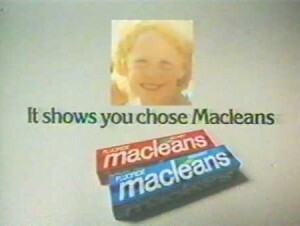 1988 advert for Macleans Toothpaste. The company is now owned by GlaxoSmithKline. In 1880, Burroughs Wellcome & Company was founded in London by the American pharmacists Henry Wellcome and Silas Burroughs. The Wellcome Tropical Research Laboratories opened in 1902. In 1959, the Wellcome Company bought Cooper, McDougall & Robertson Inc. to become more active in animal health. The Wellcome Company production centre was moved from New York to North Carolina in 1970, and the following year another research centre was built. Glaxo was founded in Bunnythorpe, New Zealand, in 1904. Originally Glaxo was a baby food manufacturer processing milk into a baby food of the same name: the product was sold under the slogan “Glaxo builds bonny babies” from 1908. Still visible on the main street of Bunnythorpe is a derelict dairy factory (factory for drying and processing cows’ milk into powder) with the original Glaxo logo clearly visible, but nothing to indicate that this was the start of a major multinational company.